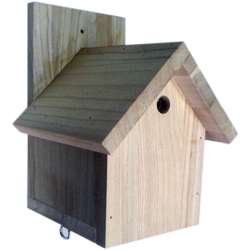 This nest box is especially designed to attract the tree nesting species of bumble bees that are important pollinators in our environment. Everything is fully assembled and complete. External woodwork is 19mm solid untreated timber. It is also the perfect alternative to keeping a hive of honey bees - no knowledge or labour is required. There is as much pleasure and learning from watching the activities of bumble bees as from keeping honey bees and bumble bees are totally benign - so this is beekeeping without the sting.